The older I get, the fewer stars I see. It must be the glasses, something in the lenses. Or the frightful thought: something in the eyes. On our backs in the camp, the start of the night sky appeared overhead. All four of us wore some kind of corrective lens. There were seven stars, and then there were eight. I counted as many as forty-five until I decided the number was less than I had seen in skies years before. Astronomers believe space is rapidly expanding, moving away from our galaxy faster every year. The first humans must have seen the night sky glittering with stars so bright, they could not have stared all night. If telescopes could see this and predict the distance of the stars over time, the fault was not in our lenses. It was definitely something in the eyes. We left home without a lot of things we needed. We had enough food for a week for the weekend. Not one of us remembered the water. It was cold and humid in the morning. There was dew on the oven mitts, reflecting the sun in lime green drops, one bit of light at a time. If we had Pat, he’d chop us some wood. If we had Courtney, she’d build us a fire. If we had. If we had. We drank beer so we wouldn’t think about water. Thoughts of water turned into thoughts of a lake of water, of a fresh spring that flowed into our campsite, as if we could will one into existence. We wouldn’t make it through the weekend without water. We turned over a stone with the beginnings of a sculpted leg. Da Vinci was just a torrential rain, we said. Michelangelo was a tornado of sand and wind. Lambs ears sprouted in the creek bed, where flat black spiders darted under warm stones when we were posed to step down. Drowned and dried up weeds looked like tattered clothes in a violent way, as if the dry rocks and trickling stream was complacent in a struggle. But they were only plants caught in a flood. But the only tattered clothes were on our legs. To emphasize our group potential, each of us had a job at the site. The men strung ropes between trees with loops interspersed to hang wet clothes or—jokingly—ourselves when we got too thirsty. The women, used to their morbidity, rolled their eyes and cleared spider webs off the picnic table with sticks of fragrant cedar. Snowy ash from the fire fell into the guac. At least we remembered the guac. We heard a round of bullets fire into the woods, and somewhere in the park a bird left a space in the sky. At night, a creature walked through our campsite when we turned off the flashlight. We held still at the edge of the woods in the pitch black. The animal moved slow as if stopping to pick fallen berries off the ground. I held my breath when it grew close enough for me to hear her grunts and grinding teeth. When she was beside me, I still could not see. The tip of a soft ear brushed my arm. Danger, fear of wildlife took over, that existence almost exactly like our own, but feral, indigenous. Life was meeting life in an arena with no rules. I closed my eyes to see the sun. I thought please be tame, please be kind as the ear ran across my arm, then my cheek. For a moment, the only thing in the world anymore was the connection of that fur and my skin, the meeting point between girl and unknown animal in the blinding dark. I felt like the earliest human, like I was meeting the world for the first time, like I could look up and the sky would be all white with stars. Later, in the tent, I put my face into a moist armpit and felt the emptiness of the open night around us settle, turning, in my dreams, to water. In the morning we left the site in damp boots and unbrushed hair. Our tents were wet, the floor was quenched, but we were not. At the nearby stream, we built a ship. We called her The Mermaid and released the ship into the drink. A maiden voyage, we shouted. Long live The Mermaid! The Mermaid went over a waterfall and drowned in the river. What we never realized was this: The Mermaid was only a float prepared by thirsty friends. That the stars are there until they’re not. That fur and skin are the only separations between us and the deeper connective tissue of the world. That this life was our maiden voyage. The tire was brand new too. The worst. 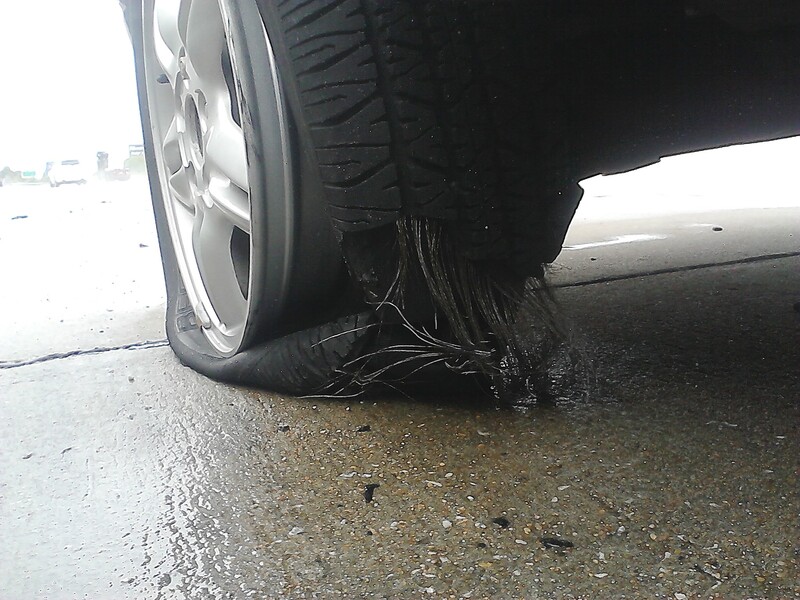 My car tire exploded on the highway today. My long-held fears of dying in a high speed car accident came uncomfortably close to being real. I pulled off on the left shoulder, on a curve in the road, and that was almost the worst part. Anyway, between punching the hazard lights and tossing the gear into neutral, I didn’t have time to check my mirrors, or think about anything else. Then I was on the roadside with my face in my hands, cringing and crying each time another car sped past, hugging the turn at top speed. It was weird to have an empty mind. I didn’t have a moment of profound realization or regret, flashbacks to other times or people. It happened very fast, and when it ended, I was left feeling a strange solitude wrap around me, like everything I have done belonged to me alone, and if I died, it would all die with me. Of course, I’m fine. Roadside service came and helped me put on the spare. I lived. So far, nothing has changed. All my plans are still scheduled. My stories are still incomplete. My relationships are the same. My worth hasn’t changed. I’m not calling old lovers, or distant family members, or settling debts with peers. The daily death speculations have shifted a little, but that will pass. I am continued. The time on the shoulder of the road, leaning into the sway of the car created by speeding traffic, has occurred. Now I’m home in my single apartment, surrounded by material extensions of myself, and I feel something else–something gone. All my windows are shut, but there is a draft coming from all over. The usual clutter is strewn, but everything has shrunk. Corners in pillows seem dented and weak. Chipped paint on the walls expand to reveal more color, older color. Is the carpet puling away from the edges of the walls? I do not know that this exists, but I know where these feelings come from. I thought, for only the 2nd time in my life, that I was actually going to die, and I didn’t. I want to share what I have, maybe so I feel something else next time I’m terrified. Maybe only so I know people saw I was trying to give something back to the world–trying to give back what I have taken from it. So I give you a new story, because we deserve it, and I need it to survive. Come over October 11th, at 8am and read it. It’s not about what happened today, but the themes are the same. And if I haven’t told you I love you lately–I do. What I hold limply in my fingers is soaking wet, embarrassing. The solidarity of the moment ruined in a sinus tangent–I’ve forget what I was thinking to sneeze loudly. This is remarkable, unmarked in the seconds before it and wiped out completely in spastic exhales seconds after. My life is remarkable. I can’t stay dry and clear long enough to complete a sentence. I speak in fragments. It isn’t my most eloquent feature. I don’t try to assume I have assailants floating around me, crawling inside and busying themselves somehow behind my swollen eyes. Instead I cover my face and walk around outside, to the points of my determination. How can I convince the chapel to let me install giant bass lines around the stage and podium? It wouldn’t take me very long to install, but–is it they’re afraid of interference? I tell the minister, maybe something inside you will resound in a way only a wordless sermon could strike–the purifying effects of a single, quavering, echoing bass vibrating against an entire congregation, not meant to exalt but to bring all gently down to the unity of the physical world. Come down, don’t be confused by the urges you are having. Can I offer you some water? Maybe you should sit down, take off your sweater, and let it finish running through those veins you forgot you had. Can we forget about securing our death this morning, like a summer home exquisitely build and furnished in a flawless location, never occupied? Can you let me talk for a second? in my mucous fragments–bursts of pressure and I temporarily forget what I was implying afterwards, blowing my nose saying “excuse me, it must be something in the air”. I’ll convince you, I’ll tell you all I know about the wars between one and two, the excuses we make at red lights, what it looks like to see a wreckage fly carried by helicopter outside the airport window, and then you will understand what I am about to propose. Being recognizant and all that. Memory loss at red lights. 1) I know it’s hard, but I’m_____________________. 2) I am not ready for________________. 3) When I told you____________, I really meant___________. 4) My reaction to the store clerk today was _____________. 5) Sometimes I catch myself ______________ out of anger or pain. 6) I practice self-deprecation _____________. 7) I need __________ to validate me. 8) When I see someone else succeed, I ___________. 9) It’s all fun and games until _______________. 10) When I complete this exam, I will _____________. And she holds the pen very loose. To ask how far you’ve come to sob on the table she’ll soon clean. And peel back something of an unbrushed smile into the mirror. Buying hot lunch or a tube of chapstick. Those months are November, December, and January, minus the holidays—I’m not alive for those. You stood in a theater of adorning eyes. You were tired of your brilliance. It prevented you from sleeping. Not me. No. Never. I’m too busy using my hands in combat. Look: I can run away now with no hands.